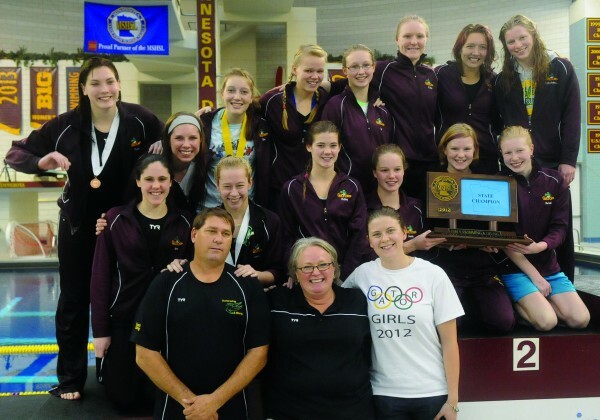 The Northfield Girls Swim and Dive Team won the Class A State Championship title Nov. 17, a feat achieved only once before in 1998. The team earned 223 points to beat last year’s champions, Sartell-St. Stephen, by 48 points. The 2012 team included seniors Emily Anderson, Allie Clark, Clara Drew, Elise Hanson, Lisa Janak, and Claire Walters; junior Emily Lundstrom; sophomores Grete Baker and Bailey DuPay; freshmen Bailey Dell and Hannah Domish; and 8th graders Carrin Baker, Sophie Bernstorf and Sophia Nevin. Coaching staff include Deb Seitz, Aleta Kolan and Dan DuPay. In the 200-yard medley relay, Allie Clark, Sophia Nevin, Grete Baker and Hannah Domish finished in 9th place, breaking the Northfield High School record set in 2001. Claire Walters finished second in the 200-yard freestyle, breaking the school record set in 1993, and Emily Lundstrom finished in 9th place. In the 200-yard individual medley, Grete Baker finished in 4th place and Allie Clark earned 13th place. Emily Anderson finished the 50-yard freestyle in 7th place. Bailey DuPay earned the top spot in diving for the second straight year. In the 100-yard butterfly, Claire Walters finished 5th and Grete Baker took 6th place. In the 100-yard freestyle, Emily Anderson placed 6th and Emily Lundstrom took 9th place. Another school record was set and an All-American Consideration time earned in the 200-yard freestyle relay, as Claire Walters, Grete Baker, Emily Lundstrom and Emily Anderson all finished in first place. Sophia Nevin earned a 10th place finish in the 100-yard breaststroke. Another All-American Consideration time and school record was set in the 400-yard freestyle relay by Claire Walters, Emily Lundstrom, Allie Clark and Emily Anderson, who finished in 3rd place. Claire Walters also broke an 11-year school record during the first leg of the 100-yard freestyle relay. Northfield High School seniors and trumpet players, Allie Clark, Helene Anglin and Annika Fredrickson opened the meet with the national anthem.